Francis, or ‘Max’ as he was known to his friends, was the eldest son of John Richard Walbran, a Yorkshire wine and spirits merchant. His father died when he was in his late teens, but by then Max, who started fishing at the age of twelve, had been apprenticed to a chemist, eventually becoming the manager of a wholesale shop in Leeds. He married Emily in 1875, by whom he had three daughters and two sons and to augment their income he began writing for the Fishing Gazette, the Leeds Mercury and The Field. 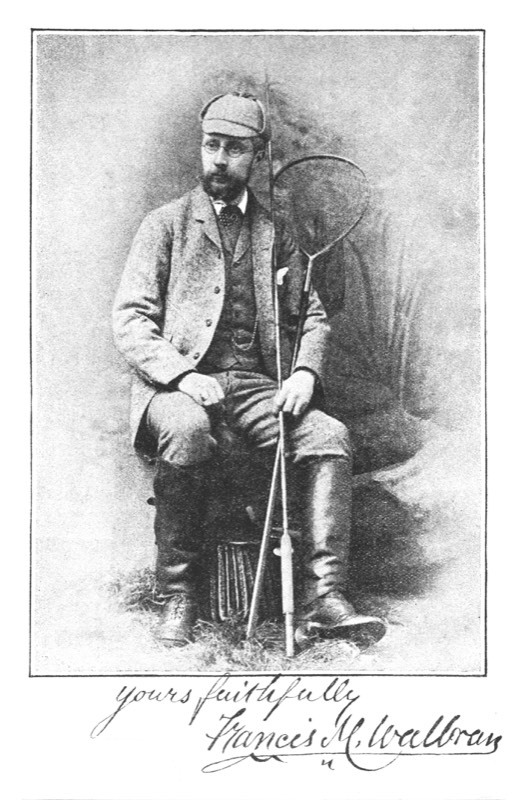 His deep interest in traditional North Country fly patterns led him to publish a new and very popular edition of Theakston’s book A List of Natural Flies as British Angling Flies in 1883; not long after, he set up his own tackle shop, The Northern Anglers’ Depot, in Leeds. One of the first products he sold from there in 1888 was an attractive and practical fisherman’s wallet packed with flies held in pockets overprinted with instructions about how to use them, and in 1889 he published another little book, Walbran’s British Angler, which was planned as the first part of a series, the remainder of which were destined never to be published. In 1892 he founded the Tanfield Angling Club on the Ure on a stretch of water he had fished in the company of angling giants like Francis Francis and Frederic Halford. Then disaster struck. The shop failed and in 1901 he was in lodgings with his sons, eking out a living from his columns. Though he continued to write, the 1895 Grayling and How to Catch Them was his last book - its descriptions of patterns verge on the poetic. Walbran died as he might well have wanted to, drowned after slipping into the icy water of his beloved Ure.